You can use advanced for loop or classical for loop to loop over array and add each object into list using add() method, this is not a bad approach and you can easily write your own utility method say ArrayUtils.toList() to encapsulate the logic. Though you need to be aware to provide several overloaded methods for different types of array e.g. byte, int, short, long, float, double, char, boolean and even object. This is cumbersome and that's why its better to use common utility library like Guava or Apache commons, which provides these kinds of handy method right from the box. Similarly, you need to write other list conversion method to convert an array of boolean, byte, short, char, long, float, double or object into corresponding List in Java. Converting a list to an array is cakewalk, all you need to do is call the toArray() method to get all items of a list inside an array. This method is overloaded too, the one which doesn't take any parameter return an Object but if you want array of particular type, you can use toArray(T) which returns all elements of array with the type you specified. It also returns elements in the order they are stored in list. If array is not big enough to store all elements another array with sufficient size is created and returned. Just remember that, you cannot convert List to primitive array with this method, only way to do this is iterating over List and converting Integer to int using auto-boxing and storing them into array. You can see that array also contains the String in exactly same order they were in List. Here is our sample program to demonstrate how to convert list to array and array to list easily in Java without using any third party library like Apache Commons Collections or Google Guava. * Java program to convert a list to array and vice-versa. System.out.println("array converted from list : "
* to convert any object to List<object. 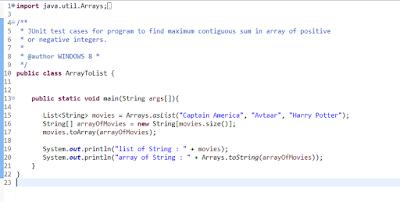 That's all about how to convert a list to array and vice-versa in Java. Yes, there is no direct utility method e.g. toList(array) in JDK API to convert an array to list but its not difficult to write one, only problem is that you need to write 9 overloaded methods to convert list of 8 primitive type and one object array. Good thing is, converting list to array is relatively easy with the help of Collection.toArray() method. Just remember to provide correct type of array as autoboxing doesn't work with array. So if you want to convert a List of Integer into array, make sure you provide an array of Integer e.g. new Integer, array of primitive int will not work e.g. new int will give compile time error. Hi Javin. I would like to point out that unlike HashMap, ArrayList doesn't has load factor. When new item(s) are added to an ArrayList, the capacity is checked. If the internal array is full, it will grow by 50% or the size that can hold all the new items. @Clarence, Yes you are correct. ArrayList grow automatically using ensureCapacity() method. They don't have load factor. You are also correct that they increased by 50% of the size that can hold all the new elements, finally elements are copied from old array to new array using Arrays.copyOf() method. Thanks for you input, much appreciated.